Cannot be Normal Summoned/Set. Must first be Special Summoned (from your hand) by banishing 2 Dinosaur-Type monsters from your Graveyard. Once per turn, during either player's Main Phase: You can dest.. If this card is Normal or Special Summoned: You can take 1 Dinosaur-Type monster from your Deck, and either add it to your hand or send it to the Graveyard. You can target 1 other Level 4 or lower Din.. This card can attack all monsters your opponent controls, once each. During your Battle Phase, if you control an "Ultimate Tyranno" that can attack, monsters other than "Ultimate Tyranno" cannot attac..
You can Tribute Summon this card in face-up Attack Position by Tributing 1 Dinosaur-Type monster. When a Dinosaur-Type monster(s) is Special Summoned from your Graveyard (except during the Damage Step.. Cannot be Special Summoned from the Deck. You can Tribute Summon this card face-up by Tributing 1 Dinosaur-Type monster. Once per turn: You can change this card to face-down Defense Position. If this .. While face-up on the field, this card cannot be banished. Each time a Dinosaur-Type monster(s) is sent to your Graveyard, place 2 counters on this card. You can Tribute this card; Special Summon 1 Din..
During either player's Main Phase: You can send this card from your hand to the Graveyard; during this Main Phase, Dinosaur-Type monsters you control are unaffected by your opponent's activated effect..
During damage calculation, if your opponent's monster attacks while this card is in your Graveyard: You can pay 1000 LP; Special Summon this card, and if you do, you take no battle damage from that ba..
During either player's turn, if your opponent Summoned 3 or more monsters this turn: You can Special Summon this card from your hand. If Summoned this way, it is unaffected by other cards' effects, bu.. This card is treated as a Normal Monster while face-up on the field or in the Graveyard. 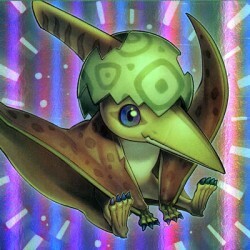 While this card is a Normal Monster on the field, you can Normal Summon it to have it become an Effect Monster .. Cannot be Special Summoned from the Deck. You can banish this face-up card you control; Special Summon 2 Level 4 or lower Normal Monsters with the same name from your Deck, but destroy them during the..
All monsters on the field lose 500 ATK and DEF, except Dinosaur-Type monsters. Once per turn, if a Dinosaur-Type monster is Normal or Special Summoned (except during the Damage Step): You can Special ..
After this card's activation, it remains on the field, but destroy it during your opponent's 3rd End Phase. Tribute 1 Dinosaur-Type monster to activate this card; while this card is face-up on the fie.. Destroy this card during your 2nd Standby Phase after activation. When this card resolves, change all monsters your opponent controls to face-down Defense Position. Monsters your opponent controls can.. Send 1 Level 4 or lower Normal Monster from your Deck to the Graveyard, and if you do, add 1 card with the same name as that card from your Deck to your hand. You can only activate 1 "Painful Decision..